You spend your life giving to others. Now it is time to receive. Come let the staff of Samasati nurture you while you indulge in a week of yoga, massage, nature hikes, beach swims, and self care workshops. Stephanie will share with you her favorite Self care practices that she has relied on for decades to help her find her center and be so full of self love that she has abundance to give to others. 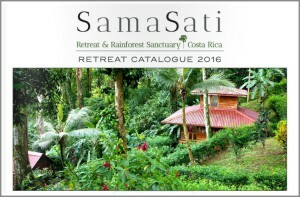 Click below to open our 2016 Retreat Catalogue, which showcases all of our 2016 retreats in beautiful Costa Rica!